The drinking horn is an iconic feature and representation of the Viking Age. Images of beastly warriors, gathered around great bonfires, raising their horns of mead in the name of strength and honor, have become synonymous with the word "Viking’’. Although there are many inaccuracies in the way modern culture portrays the Vikings, the drinking horn is a notable exception. Drinking horns were certainly used throughout the Viking Age and there is much evidence for this. Granted, the material used to create a drinking horn deteriorates into the ground quickly, and thus despite all of the evidence, there is much more out there that has eroded away with time. Horn fragments have been found in numerous excavations and their use can be seen in a strong variety of sources including, Gotlandic picture stones, Archaeological excavations, and Old Norse literature. Large stones encompassing carved images were found on the island of Gotland in Sweden. On one of these stones, we see the image of a woman stretching out her arms and offering a horn containing what could only be a beverage. The woman is accompanied by a man on horseback to whom she is presenting the horn. The scene described on this picture stone is identified as being something of Norse mythology, whereas a Valkyrie is welcoming a fallen warrior to Valhalla. Archeological finds, including the discovery of the famous Sutton Hoo longship burial, yield whole pairs of drinking horns. These pairs are of similar design and their close proximity to one another signifies the intention of their being used as a set. Drinking horns are mentioned in various Icelandic sagas, such as Ólafs saga Tryggvasonar, whereas the horn is described as being so large that a man can stand in its curve and a living human head is attached, still able to speak. Although this description of a horn appears to be entirely fictional, there is a good reason to believe that the saga writer is alluding to the tradition of fastening decorations in the form of animal heads, to the tip of the horn. But aside from picture stones, excavations, and Old Norse literature, perhaps the most interesting piece of evidence available for the use of drinking horns, are the Golden Horns of Gallehus. These horns date back to the early 5th century, which occurred hundreds of year before the Viking Age. However, it is not unreasonable to believe that evidence for the use of horns before and after the Viking Age, must conclude that they were used during the Viking Age. In the summer of 1639, a peasant girl named Kirsten discovered an unusually long golden horn in the village of Gallehus, Denmark. She happened upon it when she saw it protrude above the ground, revealing its shiny golden makeup. Once the horn had been unearthed, she wrote a letter to King Christian IV of Denmark, who acquired it for himself. In turn, he then gave it to a Danish prince, who was responsible for refurbishing and fixing possible broken pieces. About one hundred years later, in the spring of 1734, a second horn was found only a short distance away from the location of the first one. This horn was slightly damaged, and much shorter than the first, but soon revealed signs to its originating during the Viking Age. Runic inscriptions bearing the following statement "I Hlewagastiz Holtijaz made the horn’’ were engraved around the rim of the horn. 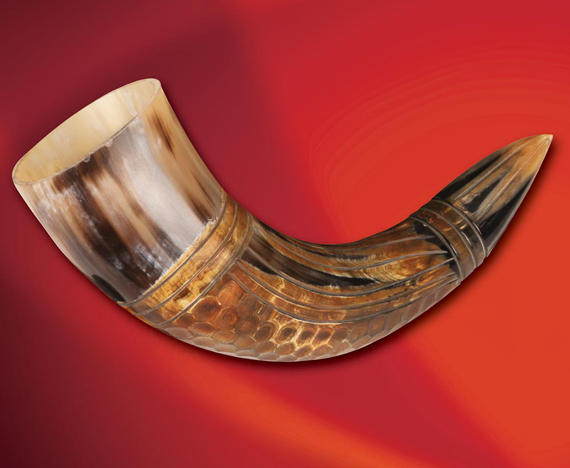 There is much evidence for the use of drinking horns throughout Medieval Scandinavian history. The numerous archeological finds, picture stones, and mentions in Old Norse literature enforce the enduring image of Nordic warriors gathered around great bonfires, their drinking horns brimming with mead. Explore multiple varieties of the Viking Drinking Horns with Museum Replicas.